Product feature: The most intensively Grappa. The multifaceted fruit scent of the Riesling is also present in this grappa. It has notes of peach, apricot, quince, and green apple. It tastes full-bodied and characteristic, at the same time, it is surprisingly smooth. Hochpustertaler cheese dairy Three Peaks approx. 500 gr. This expressive and fruity Pinot Noir achieves its special finesse due to the large wooden barrels in which it is aged. Its silky but powerful body makes "Patricia" a wine that should be served with hearty meat dishes. Grappa Gewürztraminer 70 cl. - Roner South Tyrol 32,60 EUR / 46,57 €/lt. Grappagnac 50 cl. - Walcher South Tyrol 27,45 EUR / 54,90 €/lt. Abbagnac Grappa 70 cl. - Abbazia Novacella South Tyrol 31,85 EUR / 45,50 €/lt. Grappa Ambra La Morbida 70 cl. - Roner South Tyrol 29,55 EUR / 42,21 €/lt. Grappa La Morbida Roner 70 cl. - South Tyrol 26,45 EUR / 37,79 €/lt. Grappa Superiore Original 50 cl. - Pircher South Tyrol 12,75 EUR / 25,50 €/lt. Grappa Chardonnay 50 cl. - Pircher South Tyrol 19,95 EUR / 39,90 €/lt. Grappa La Gold Roner 70 cl. - South Tyrol 23,15 EUR / 33,07 €/lt. Grappa Lagrein Roner Riserva 70 cl. - South Tyrol 68,90 EUR / 98,43 €/lt. 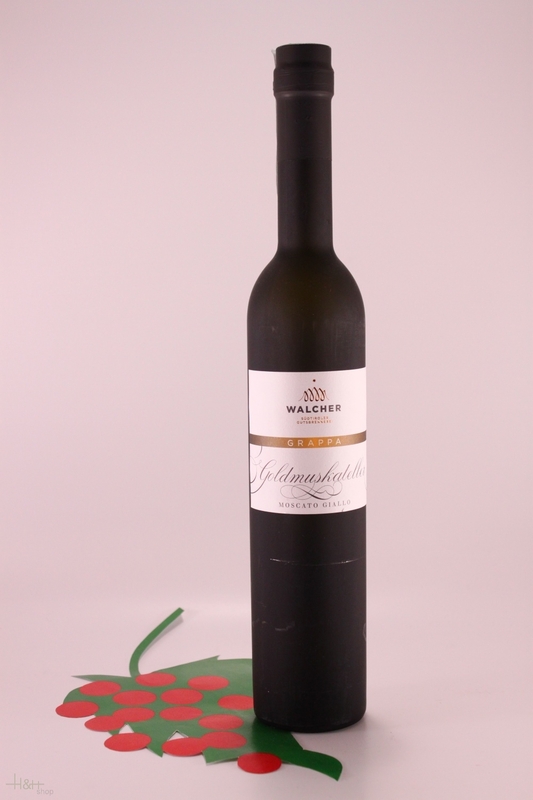 Grappa Gewürztraminer 0,5 lt. 42 % - Distillery Zu Plun 34,35 EUR / 68,70 €/lt. Grappa D' Agricoltor - Farmer's Grappa 70 cl. - Roner 22,55 EUR / 32,21 €/lt. Grappa Veltliner 0,5 lt. 42 % - Distillery Zu Plun 34,35 EUR / 68,70 €/lt. Grappa Müller Thurgau 70 cl. - Roner South Tyrol 32,50 EUR / 46,43 €/lt. Grappa Blauburgunder Barrique 42 % 50 cl. - Distillery Köfelgut 24,05 EUR / 48,10 €/lt. Grappa Sylvaner 70 cl. - Abbazia Novacella South Tyrol 28,60 EUR / 40,86 €/lt.